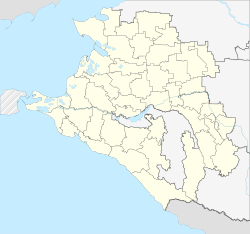 For other uses of "Krasnodar", see Krasnodar (disambiguation). 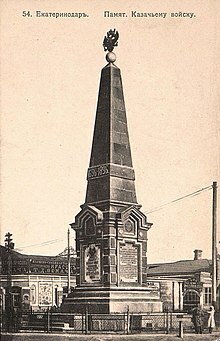 A 19th century photo depicting Kuban Cossacks obelisk in Yekaterinodar. Krasnodar (Russian: Краснода́р) is a city in Southern Russia on the Kuban River, around 148 kilometers (92 mi) northeast of the Black Sea port of Novorossiysk. It is the administrative center of Krasnodar Krai (also known as Kuban). It had a population of 744,900 in 2010, 646,175 in 2002 and 620,516 in 1989. 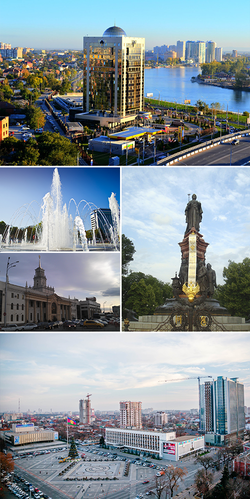 The city was founded on January 12, 1794 (Gregorian calendar) as Yekaterinodar (Екатеринода́р). The original name meant "Catherine's Gift", both in recognition of Catherine the Great's grant of land in the Kuban region to the Black Sea Cossacks (later the Kuban Cossacks), and also in recognition of Saint Catherine, the Martyr, who is considered to be the patron of the city. After the October Revolution, Yekaterinodar was renamed Krasnodar (December 1920). There are two potential meanings for the new name of the city: Krasno- (Красно-), meaning either 'beautiful' (an older root) or 'red' (especially relevant considering the political atmosphere of the time); and -dar (-дар), meaning 'gift'. Thus, the city's name means either beautiful gift or red gift (i.e. 'gift of the reds').. The origin of the city starts with a fortress built by the Cossacks in order to defend imperial borders and claim Russian ownership over Circassia, which was contested by Ottoman Turkey. In the first half of the 19th century Yekaterinodar grew into a busy center of the Kuban Cossacks. It was granted town status in 1867. By 1888 about 45,000 people lived in the city and it became a vital trade center of southern Russia. In 1897, an obelisk commemorating 200 year old history of Kuban Cossack Host was built in Yekaterinodar. During the Russian Civil War the city changed hands several times between the Red Army and Volunteer Army, many Kuban Cossacks were committed anti-Bolsheviks who supported the White Movement. During the Great Patriotic War (World War II), Krasnodar was occupied by the German Army between August 12, 1942 and February 12, 1943. The city sustained heavy damage in the fighting but was rebuilt and renovated after the war. In the summer of 1943, the Soviets began trials, including of their own citizens, for collusion with the Nazis and participation in war crimes. The first such trial was held at Krasnodar on July 14–17, 1943. This was the first public trial of the mass murder of Jews during the Holocaust. The Krasnodar tribunal pronounced eight death sentences, which were summarily conducted in the city square in front of a crowd of about thirty thousand people. Famous Russian soprano Anna Netrebko, soprano Evgenia Kononova, cosmonaut Gennady Padalka, counterrevolutionary Andrei Shkuro and rhythmic gymnast Inna Zhukova were born in Krasnodar. Another notable native of Krasnodar is Greece basketball international Lazaros Papadopoulos, who emigrated to Greece with his Pontic Greek parents when he was 10 years old. Krasnodar is home to the steel lattice hyperboloid tower built by the Russian engineer and scientist Vladimir Grigorievich Shukhov in 1928; it is near Krasnodar Circus. The most interesting place of Krasnodar is Krasnaya Street (which translates as "Red, Beautiful Street"). There are many sights there. In the beginning of this street one can see the Central Concert Hall; at the other end one can see the Avrora cinemacenter. A "Triumphal Arch" is in the middle of Krasnaya Street. The main airline is Kuban Airlines (at Krasnodar International Airport), and the largest hotels in the city include the Intourist, Hotel Moskva, and Hotel Platan. Krasnodar uses a 220 V/50 Hz power supply with two round-pin outlets, like most European countries. Public transportation within Krasnodar consists of city buses, trolleybuses, trams, and marshrutkas. Trolleybuses and trams, both powered by overhead electric wires, are the main form of transportation in Krasnodar. Unlike Moscow and Saint Petersburg, Krasnodar does not have a metro system. The coat of arms of Yekaterinodar was introduced in 1841 by the Cossack yesaul Ivan Chernik. The royal letter "E" in the middle is for Ekaterina II (Russian for Catherine II). It also depicts the date city was founded, the Imperial double headed eagle (symbolizing Tsar's patronage of Black Sea Cossacks), a bulawa of a Cossack ataman, Yekaterinodar fortress, and flags with letters "E", "P", "A", and "N" standing for Catherine II, Paul I, Alexander I and Nicholas I. Yellow stars around the shield symbolized 59 Black Sea stanitsas around the city. Wikimedia Commons has media related to Krasnodar. This page was last changed on 5 April 2019, at 11:56.